Wenzloff & Sons D-PS-CR26 Disston 26 inch Rip Hand Saw-Maple, 5 PPI. Summary: Poor workmanship, poor communication, high price. Pros: The saw was in stock and shipped quickly. Very well packaged for shipping via FedEx. Cons: The saw blade was finished worse than one from Home Depot. No exaggeration or sarcasm. Refer to the posted pictures. The finish of the blade is poor with patches of dark, deep, coarse gouges, oblique to the rest of the finish, like those from a belt sander. 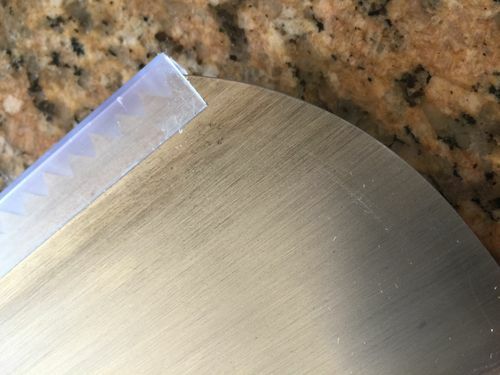 There are numerous smaller scratches from apparent poor handling that run along both sides of the blade. They did not photograph well with the camera on my phone. Scratches curving around the heel as well. 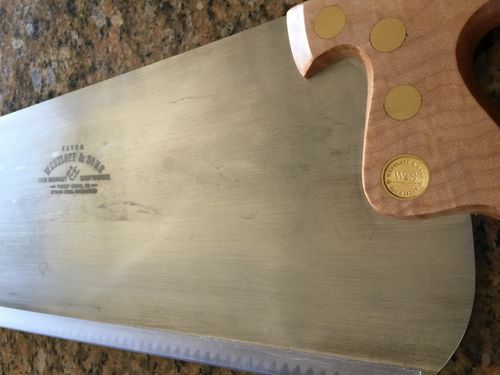 The etched logo on the blade shows a darkened rectangular background. There is a small amount of tear out around the screws. Additionally, the blade is slightly warped to the right. From my limited personal experience, the finish on saws from Bad Axe and Lie-Nielsen are exponentially better. To ensure the problem was not shipping damage, I carefully inspected the packaging. The paper wrapping around the saw was not torn or abraded. The bubble wrap was also intact and the shipping box showed no signs of crushing, tearing, deforming, or repackaging. Whom ever finished the saw or inspected it either needs immediate retraining, has failing eyesight, was in a hurry, said the heck with this customer, or all of the above. Wenzloff has an F rating from the Better Business Bureau and an unresolved complaint. I attempted to have the problem fixed by Wenzloff using the provided customer service email address. I received no response even though I had received email from that address. No telephone number is provided. I then tried to fix the problem using Mike Wenzloff’s personal business email address, again with no response until I called his home telephone number. Mr. Wenzloff said he had not received prior emails from from me. I am now corresponding with Mr. Wenzloff by email. He has said he will fix the problem and cover the shipping. I will update this review after I return the saw and receive a replacement. That stinks, like you I’ve read nothing but the highest superlatives for them. When you invest that kind of money for a tool like that, you certainly want it to be of the highest quality. Good luck with the replacement. +$350 for the saw, right? I always looked upon these saws with envy. I tried to buy one once but the delay was much longer than was promised. I cancelled. I no longer have envy in my heart. Hope things work out for you.I have moved on to Lie Nielsen and they do the job well enough.